I’ve made this recipe a bazillion times before now and I was always thinking that I have to share it with you guys. By the time they were done, I’d just want to dig in – so sorry ’bout that (hope you’ll forgive me 😀 ). Wait no longer, I tells ya! The spice blend is simply a bunch of spices you probably have on hand in your pantry (oregano, paprika, brown sugar, cayenne and good stuff like that)- nothing complicated. I do use a fair bit of cayenne pepper (cause you know this chicka likes it spicy, but you can use less if you like (or not at all)). I prepared these ribs on Saturday; everything in this post is a tad casual (hey, it’s how I roll in the summer). Plus, we are actually getting to enjoy our deck a lot more. Why, you ask? Well, we (hubby) stripped the stain from our deck; it was peeling off ever so badly. Now, it looks brand spankin’ new! We have our deck furniture out there, some potted plants and our new propane fire pit. Oh, good times! We can actually enjoy our outdoor area for the limited time we are nice weather ’round here. However, don’t let me dare find a spider cause I will FREAK out, but you probably already knew that, didn’t you 😛 ? On your fat trimmed ribs massage those spices into the meat, wrap in parchment, a little foil and throw in the oven (ok, not literally throw, but you get the drift). 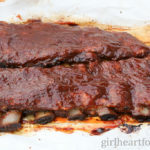 The parchment paper acts as a little steamer for those ribs and keeps the moisture where it should be – in the meat. 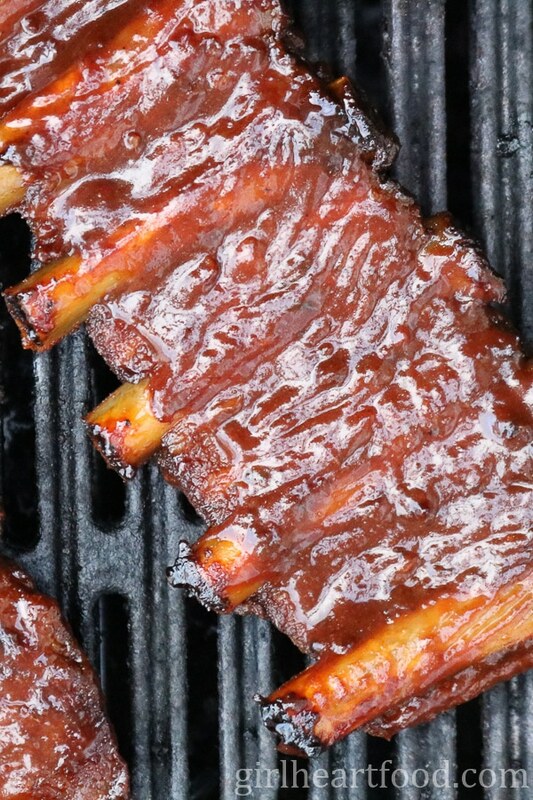 Once the ribs are cooked, brush with barbecue sauce and grill to kinda caramelize that sauce and just dig in. I love mine a little extra charred, but you can cook to how you like ’em; you do you. Oh, don’t forget those napkins cause you’re gonna need ’em. 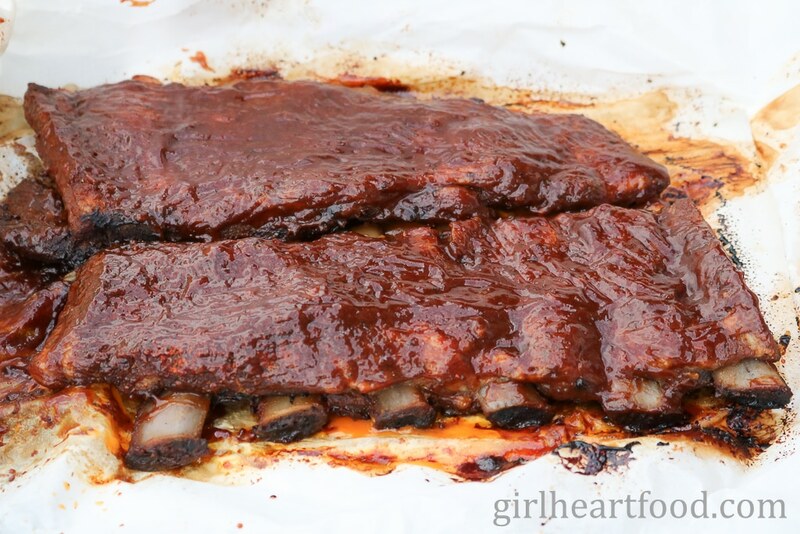 But, I say when you are eating something like ribs, the messier the better….that just means it tastes extra yummy. I usually serve these ribs with veggie kabobs and corn (cause the veggies totally cancel out the calories in the ribs – yeah right), but potato salad or pasta salad would be pretty sweet too. Hope you love these Easy Fall-off-the-Bone Ribs as much as we do! They are in high rotation during the summer months around here. P.S. hubby makes an ‘appearance’ in the video brushing the sauce on the ribs 😀 He is totally the grill master in our home. This recipe for Easy Fall-off-the-Bone Ribs is deeeeelicioius! A simple spice mix combining both sweet and spicy components are blended together; the ribs are massaged with the spices and baked for a bit. After, they are brushed with your favourite barbecue sauce and grilled. Then, all that's left to do is dig in! 2 lbs pork side ribs -trimmed of excess fat. See below. Preheat oven to 325F. Combine all spices together in a small bowl, stirring to incorporate. Pat spice mixture into ribs, pressing into meat and covering all over. 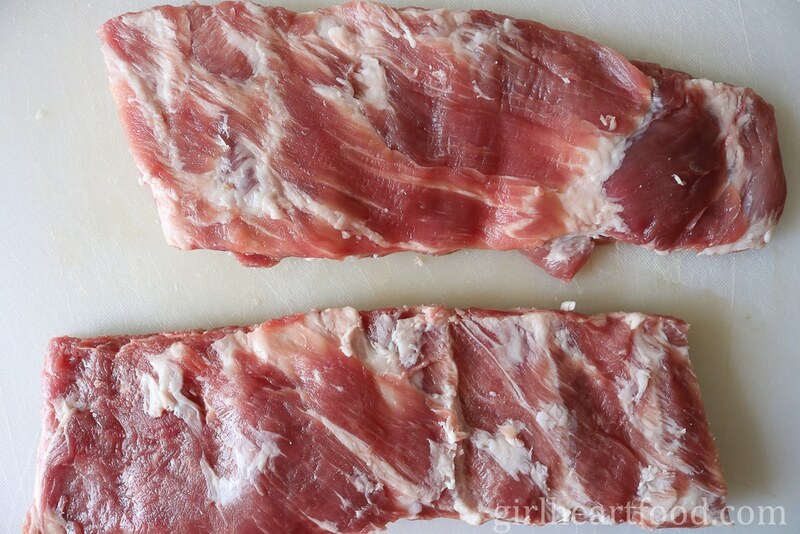 Wrap ribs with parchment paper. Then wrap ribs with aluminum foil. Place in dish and bake for 2 hours, 15-20 minutes. Carefully remove from oven and carefully unwrap (there will be steam). Preheat grill to medium low. 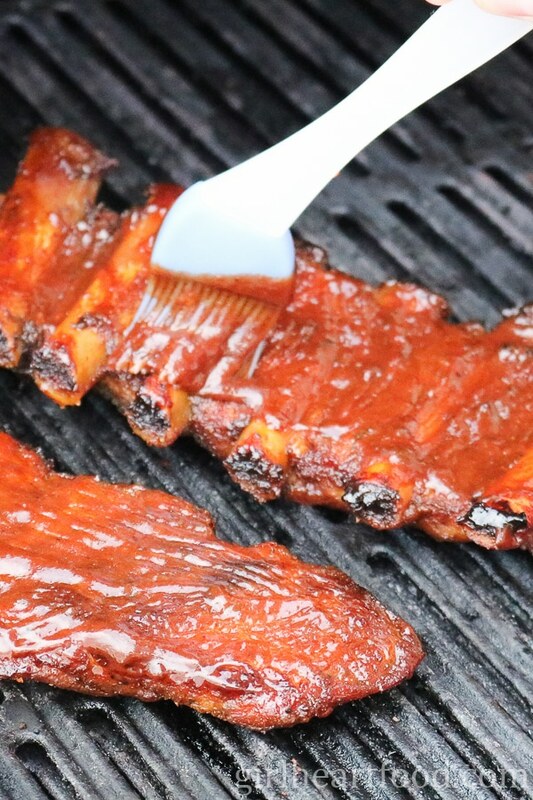 Brush one side of ribs with your favourite bbq sauce. Place bbq sauce side down on grill and cook for 3-5 minutes. Turn and coat other side with bbq sauce and cook 3-5 minutes more. The ribs are already cooked before grilling; you just want to caramelize/warm the sauce a little. Remove from grill and enjoy! I had one rack of ribs, about 2 lbs. In order to handle easier, I cut the rack of ribs in half before proceeding with the recipe. Best ribs I’ve ever made!! I have not made ribs any other way since discovering this recipe. Thank you so much, Brandy – made my day to hear that 🙂 They’re a favourite in our home, especially in the summer months. Really happy you enjoy them too!! These really were falling off the bone. The brown sugar rub was just amazing!!! Wow these rib look delicious, perfectly cooked and fall off the bone, just how we like them! Love the spice blend too! Really a must try! We had a wonderful time last night with these tender and delicious ribs. My family kept asking me for the secret and I directed them to your blog for amazing and easy recipe. Thank you for sharing. Thank you Sheila! Happy to hear that you enjoyed them 🙂 !! I am a sucker for falling off the bone meat. 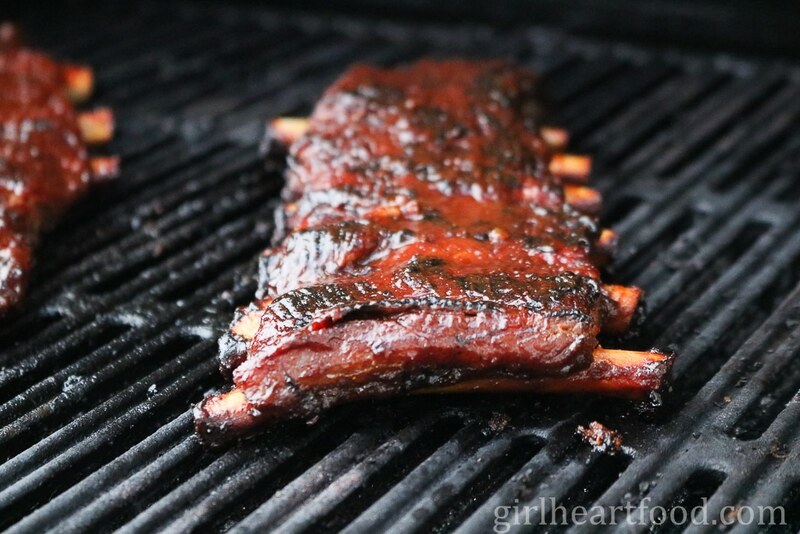 These ribs look mouth-watering! Your spice rub sounds wonderful! Thank you so much Thao 🙂 !! These look so delicious and I just love how easy they are to make. Can’t wait for summer to get out the grill and make these! Thanks Kate! They are pretty delicious 🙂 !! Your fall-off-the bone ribs are right up my alley! Love the combination of sweet and spicy and I completely agree with you – the messier the better 🙂 Summer is all about al fresco eating but I am totally with you when it comes to crawlies … Have a lovely weekend, Dawn! Thank you Miriam!! Glad I’m not the only one 😉 Have a lovely weekend too!